The Soho Theatre has been transformed into a mini-forest and its floor dressed with dry leaves. No, don’t go back, you are in the right theatre and the stage is set for Inua Ellams’ new play, Untitled, his second one-man theatre production. A poetic and magical story set in Nigeria, Untitled explores the intrinsic relationship of Nigeria to its citizens both in the motherland and in the Diaspora. It is a story of destiny, choices and consequences, and our life’s trajectory being determined by our names. And so, we meet X, a nameless boy, whose cry at his naming ceremony means he has rejected his name. This means he is going to be a man with no destiny and will be disconnected from the rest of society. 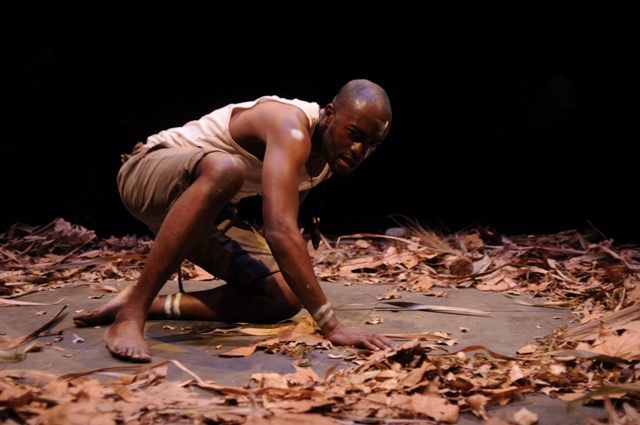 A point Ellams helps us to understand with his use of a free flowing narrative and body language/actions on stage which helps us to see a boy who grows up into a man that runs free and wild in the local village and is a law to himself with no regard for the laws of the land. Ellams press release mentions the play is to coincide with Nigeria’s 50 years of independence, what an ironic representation the young man gives us about Nigeria and it is not very far from the truth. Untitled is co-commissioned by Soho Theatre, Fuel and Contact and developed as part of Fuel at the Roundhouse and at Cove Park. Below is a trailer of the play Enjoy! This entry was posted on Monday, October 4th, 2010 at 2:20 am	and is filed under Africa, Black Britain, People, Theatre Reviews. You can follow any responses to this entry through the RSS 2.0 feed. You can leave a response, or trackback from your own site.